What 2017 reminded me: When faced with adversity, show up as yourself, and things will shift around you to your benefit. It would have been easy to sit down and cry about all the changes in the world that were causing suffering among my friends, my family, my people, but drum magic does not work that way. I had to be certain to honor that which has given me so much by continuing to honor it and all my teachers and ancestors who made sure the drum was still here, vibrant and waiting for new hands. So I played. I played every chance I got, with people who asked for the medicine. In 2017, the drum took me far and wide, healed me, fed me, clothed me, brought me new friends and helped me build stronger networks and communities. Looking back, all things considered,; I had a good year. With 8 gigs around Southern California, EthioCali kept me in the club, bringing soulful rhythms to the people. The only group I performed with more in 2017 was Viver Brasil, who is now in their 20th year! I like to think of myself as partially raised in VB; it's definitely one of my pillars of strength. Rocky Dawuni rounds out my live 2017 Southern California stops with 4 summer performances all over the place..
2017 got me to deepen my craft by working as a teacher and as a guest artist in unique collaborations and venues. I had a good time playing the Carters' Push Party with regulars of my Monday Night Drum class at KAOS network. Lady Antebellum invited me to Las Vegas to play the American Country Music Awards and then called me up when they came to town to play the Hollywood Bowl. 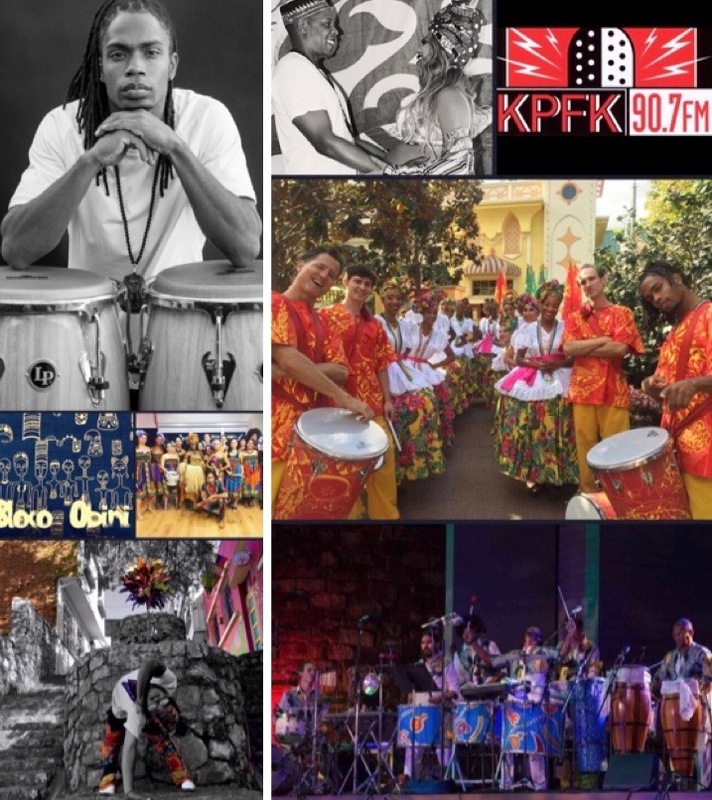 My Sunday Afro-Brazilian drum class students got so good, I realized they needed additional opportunities to work their craft, so I founded Bloco Obini, an all-women drum corp who performed at the Ford Amphitheater. I returned to Japan for yet another successful recording session with Takarasuka and found myself in studio with Kamasi Washington here in Los Angeles. I had a mini-residency on The Voice and met some Little Big Shots with Steve Harvey. I got to assist one of my elders, Dona Cici, as she brought incredible knowledge and information to Southern California in workshops and performances with Viver Brasil. If you were following my Instagram, you may have thought that t I just switch up drums and style and I get the gig. Not quite true. Let me tell you about the chameleon. He was serving as the emissary for Obatalá (owner of the white cloth and sky) in the equivalent of a deity dance battle against Olokun (owner of the bottom of the sea and all the wealth that falls down there). Olokun was convinced that he had the freshest moves and the biggest dance floor as far orixás went: he and he alone should be crowned top orixá. Of course, haters reminded him of the fly sky guy, Obatalá. They told Olokun that they were pretty sure that Obatalá had him beat on all fronts: technique, skill, delivery, and artistry. Olokun was not having it. He declared a battle. He sent word up to the sky that it was on. Obatalá was confused and concerned: he was a man of great words, not big moves and flashy fists. He made things happen with his intellect and really had no time for ratchet, time-wasting foolishness...but he also liked to look good, and be well-respected. He knew he had to throw down at this battle. No fool, he went for divination first. The Oracle told him to send the chameleon to Olokun to accept the invitation to battle. It sounded odd, but Ifá, the Oracle, had yet to steer him wrong, so he called Chameleon and told him that he needed to go and meet Olokun to accept a dance battle on his behalf. As you know, the chameleon changes colors as it moves across different terrains. It carefully steps, making sure that when its foot falls, it won't be the last step it takes. To ensure that each step ends in success, the chameleon's skin shifts to hide it in plain site. The Chameleon is baaad. At the appointed deadline, Chameleon shows up in Obatalá's place to accept that battle and set the terms. Olokun looses his mind. Obatala's messenger was better dressed than he was! So He ran back into his house to change clothes. When he came back out, Chameleon had changed, too. This happened three more times. Olokun concede that battle, he did not even want to mess with Obatalá if his underling was this fresh! So understand this: wherever I am sent by the drum magic, I am always me. I am honored to be called upon because of how The Sound moves through me, or, as in the case of Chameleon, how the Light colors my world. When you see me on the stage with Lady Antebellum or hear me on a Kamasi Washington record, or jam with me at KAOS in a Monday night class, I'm just stepping carefully, following the Sound, letting the Light reflect what needs to be seen. I want to thank each one of you for supporting the Art in 2017. Keep winning your battles by being in service to your true self.